Your trade show booth design is what will make or break the entire event for your company. It’s the first thing people will notice, and making a great first impression is key to generating interest. With the right approach, you can attract a comprehensive array of people, from casual exhibit attendees to industry professionals. Fortunately, Evo Exhibits’ industry experts have compiled a list of the top trade show booth design tips. They work regardless of what industry you’re in and are used by the biggest companies in the world to draw large crowds. Want all the other competitor booths around you to watch in envy as you get all the attention? Then read on and you’ll learn some golden nuggets to tilt the odds of success in your favor. Unless you’re an industry leader like Nike, Louis Vuitton and McDonalds, you need to illustrate what your company actually does. Your brand name is important, but your unique selling point should be at the forefront of your booth. Once you become an established brand, the name alone can do the talking and immediately people will associate your brand name with what you’re about. If your sales representatives are commonly asked, “What do you do?”, then you have done it wrong. Your banners, graphics, and illustrations should tell the audience the function of your brand. This will streamline the interactions between your sales rep and trade shower attendees, ensuring their questions are more targeted and specific for higher-value conversations. Don’t make the mistake of assuming that the idea behind your company is straightforward. You are living in that world on a daily basis and understand the concept inside out. For the general public, it might be confusing and you need to spell it out for them. Every piece of booth real estate should be designed with branding in mind. The colors from a distance should mimic your brand identity. For example, if you use a lot of orange and white in your online/offline marketing, then design the booth with those colors too. Perhaps there are particular shapes that are used throughout your brand like circles or triangles? Include these too – anything that will visually allow your target customer to immediately recognize you. Even if you’re relatively new to the industry, getting started with brand identity should be a priority from Day 1. The sooner you become memorable in the mind of your consumer, the easier it will be to stand out at a trade show. 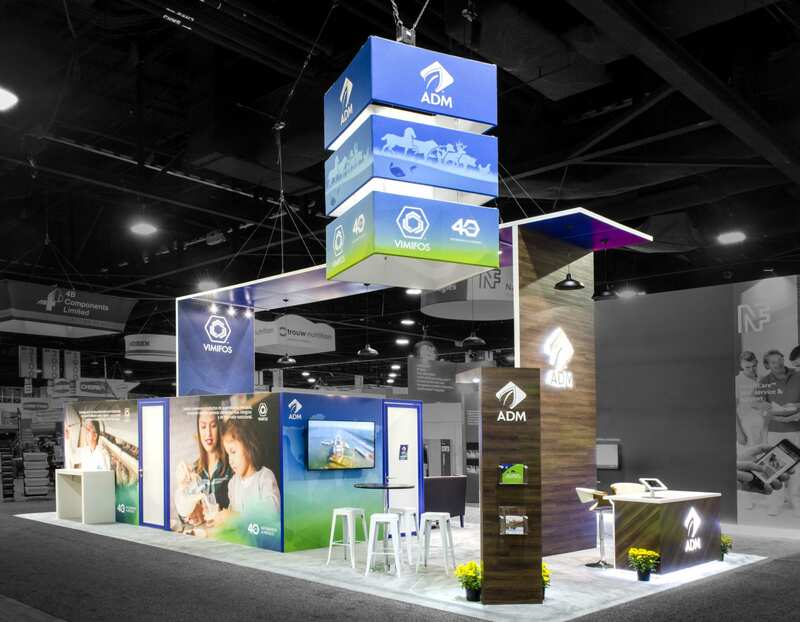 One of the top trade show booth design tips to follow is to be consistent with all the branding that you have done before going to the trade show. Exhibit attendees that are not your target market must be This ensures you do not get overwhelmed with questions from people that are never going to buy your products. Ambiguous trade booth designs can lead to a flurry of pointless questions that your sales reps will have to spend time answering. The graphics must convey the purpose of your brand and possibly the philosophy too. Get as much information across as you can so that the target customer is intrigued to find out more. However, don’t make the mistake of cramming in too much into the graphics as it can lead to confusion. Try to be provocative or controversial, but in a way that will not alienate your target customer. Make bold statements and unorthodox claims if you can deliver on them – graphics can be a powerful tool to accomplish that. Virtual Reality: In recent years, there has been a huge spike in interest regarding VR and you could add such an experience to your booth. It doesn’t matter if you do not operate in an industry where technology is a big factor. For example, let’s say you’re in the restaurant business. You could include a virtual tour of a new line of restaurants. The tables would be filled with every single dish on the menu so that the customer can visually see what’s on offer. People passing by will be intrigued about what kind of VR experience is on offer and get in line to give it a try for themselves. Recharging Oasis: Modern smartphones have taken over the world and you can take advantage of that fact to draw crowds. How? Well, the problem with smartphones is that they are battery-hungry devices that need constant recharging. At a trade show, attendees are probably taking photos, recording footage, and constantly logging in to their work servers, which consumes a significant amount of battery power. You could provide a comfortable place to sit down and recharge their mobile devices. While they are within the confines of your booth, you can convert the casual visitor into a buyer. Games and Competitions: Interactive games and competitions are a great way to create a buzz around your trade show booth. Think of some cool prizes to give away and you’ll have a flock of engaged trade show attendees interested in what’s going on at your booth. The exposure will help you stand out from the other booths and sell your products. At a trade show, people expect to see the latest and greatest technologies, which means you need to be up to date. Look at what some of the other big companies around the world are doing at their trade shows and take note. The amount of space you have to work with at the trade show should be utilized correctly. You need to strike the right balance between offering as much as possible without creating the feeling of clutter. Attendees like open spaces that they feel comfortable in, so don’t cram stuff in between narrow spaces – it will not work. Consider the vertical space too. Hanging signs are a great way to attract attention as soon as attendees enter the building. Create that “wow” factor with your trade booth design and you’ll set the right tone for the professionalism of your trade show booth design. The trade show booth design tips in this article are just the tip of the iceberg. There are plenty of other design considerations you need to make to ensure that the right approach is taken. However, these tips provide a great place to start that’ll give you a distinct advantage over the competition. We hope that these trade show booth design tips come in handy during your next outing and you hit the sales quota you’re aiming for. You cannot go wrong by creating a genuinely fun and informative experience for the trade show attendees. At Evo Exhibits, that’s our goal. Contact us today to make your next trade show experience unforgettable!